Maurizio Sarri has reportedly barely spoken to Chelsea club captain Gary Cahill all season long in a shock revelation made by the Telegraph. The former England international has not been a regular member of the Blues first-team this term since Sarri replaced Antonio Conte, but this increasingly looks a big error in judgement. As noted by the Telegraph, Sarri’s predecessor Antonio Conte saw the value in keeping hold of veteran defender and club legend John Terry when he first took over at Stamford Bridge. Terry has since been really missed as this Telegraph report suggests Chelsea now really lack leaders in their squad. 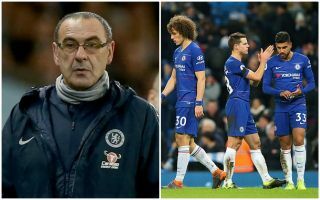 Cahill is one who falls into that category due to his experience and winning mentality, but he’s been almost completely frozen out by Sarri, according to this piece. Chelsea fans will be gutted to see this happening to their club after they for so long seemed a group of characters who could always guarantee a fight even if they didn’t win major trophies every single year. The era of Terry, Didier Drogba, Frank Lampard and others now seems a very long time ago, and it’s a shame Sarri seems blind to one of the best ways to fix that.